The appointment of federal judges for United States federal courts has become viewed as a political process in the last several decades. This is especially true of U.S. Supreme Court and court of appeals appointments. The tables below provide the composition of the Supreme and circuit courts at the end of each four year presidential term, categorizing the judges by the presidential term during which they were nominated for their seat. As of April 1, 2019, of the thirteen federal appeals courts excluding vacancies, Democratic appointees have a majority on seven, Republican appointees have a majority on five, and one federal appeals court is equally divided between Democratic and Republican appointees. However, the party of the president who appointed a judge is not always a good indicator of that judge's judicial philosophy and place on the political spectrum. The Supreme Court of the United States was established by the Constitution of the United States. Originally, the Judiciary Act of 1789 set the number of justices at six. Subsequently, the United States Congress increased the number of justices to seven in 1807, nine in 1837, and ten in 1863. The Judiciary Act of 1869 reduced the number to nine once again. The United States Courts of Appeals were established by the Judiciary Act of 1891 as "United States circuit courts of appeals" (the name was changed to its current form in 1948). 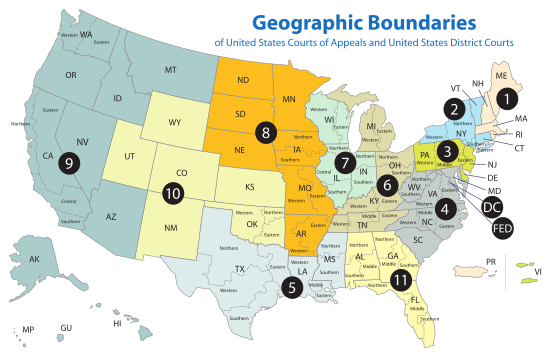 The act authorized 19 appellate judgeships in 9 circuits. Since then, the number of authorized appellate judgeships has increased to 179. There were temporarily 178 existing appellate federal judgeships, due to the elimination of a 12th seat on the D.C. Circuit by Section 509 of the Court Security Improvement Act of 2007. The Act also provided for the creation of a 29th seat on the Ninth Circuit in January 2009 which increased the number of authorized appellate judgeships to 179 again. The 5th Circuit judges who were transferred to the 11th Circuit in 1981 are not included in the 5th Circuit numbers for 1980 for trend comparison purposes. SEC. 509. of the Court Security Improvement Act of 2007 provided for the creation of a 29th seat on the Ninth Circuit in January 2009. The 11th Circuit was created in 1981. The judges that were transferred from the 5th Circuit to the 11th Circuit are shown in 1980 for trend comparison purposes. SEC. 509. of the Court Security Improvement Act of 2007 eliminated the 12th seat on the D.C. Circuit. The Federal Circuit was created in 1982. The judges from the courts that were combined into the Federal Circuit are shown in 1980 for trend comparison purposes. ^ a b c "Text of H.R. 660 (110th): Court Security Improvement Act of 2007 (Passed Congress/Enrolled Bill version) - GovTrack.us". GovTrack.us. This page was last edited on 16 April 2019, at 15:27 (UTC).